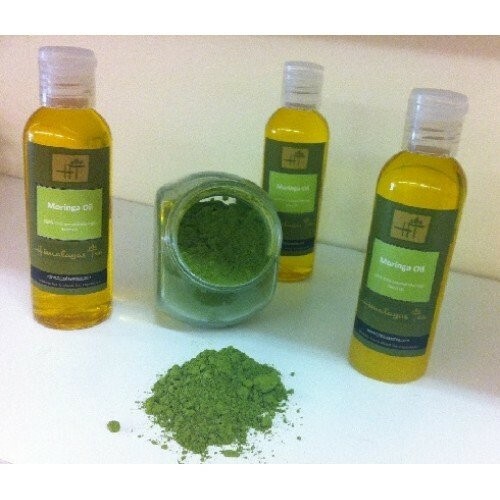 Cold pressed from the Miracle Tree, our Moringa Oil is as pure as it gets. Try it to experience the miracle treatment for yourself. Moringa oil works wonders with almost anything. Made from the moringa seed of the miracle tree, our moringa oil is cold pressed to an oil that absorbs within seconds and doesn't grease the skin. It's an ideal treatment for skin and joint problems, and the bottle lasts a long time because you only need to apply one or two drops to the area of use. For example, if you're in pain apply to the area that hurts or the area of skin that you want to be rejuvenate. You can also add a few drops to your shampoo to see a richer fuller hair. Use this Miracle tree oil for your dry skin, back pain, stress neck pain, joint pain, Arthritis and in your salads.You will be amazed with the results.